The first decade of the 21st century was the warmest decade recorded since modern measurements began around 1850. It saw above-average precipitation, including one year – 2010 – that broke all previous records. It was also marked by dramatic climate and weather extremes such as the European heatwave of 2003, the 2010 floods in Pakistan, hurricane Katrina in the United States of America (USA), cyclone Nargis in Myanmar and long-term droughts in the Amazon Basin, Australia and East Africa. 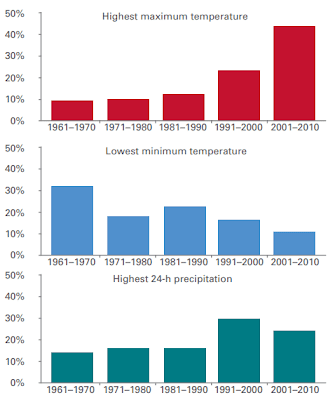 While climate scientists believe that it is not yet possible to attribute individual extremes to climate change, they increasingly conclude that many recent events would have occurred in a different way – or would not have occurred at all – in the absence of climate change. For example, the likelihood of the 2003 European occurring was probably substantially increased by rising global temperatures. Later in his own article Anthony quotes the 2000% increase in deaths from heatwaves in the last decade. I guess he's got to keep reassuring his scared readers that there's "nothing to worry about, she'll be right, mate." They say more complete datasets are needed. 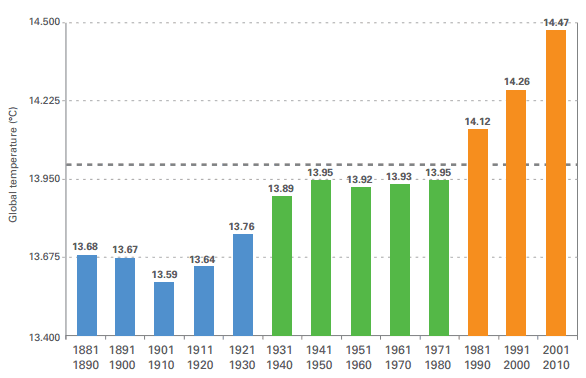 They also fail to mention “the pause” of global temperature during the decade of study, using only bar graphs to illustrate temperatures instead of trend lines, while at the same time state that “A decade is the minimum possible timeframe for detecting temperature changes.” They also mention “it is not yet possible to attribute individual extremes to climate change,” and they hint that “some may have occurred in a different way – or would not have occurred at all”, which is just political lip service, and no evidence is cited. Figure 1. Decadal global combined surface-air temperature over land and sea-surface temperature (°C) obtained from the average over the three independent datasets maintained by the UK Met Office Hadley Centre and the Climatic Research Unit, University of East Anglia, in the United Kingdom (HadCRU), NOAA-National Climatic Data Center (NCDC) and the US National Aeronautics and Space Administration-Goddard Institute for Space Studies (NASA-GISS). 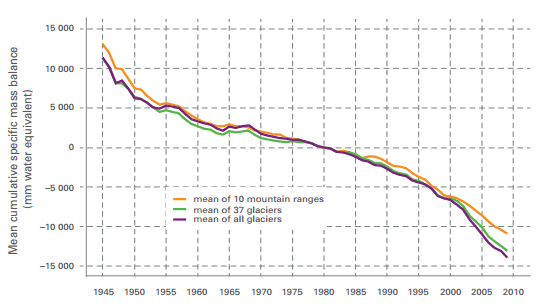 The horizontal grey line indicates the longterm average value for 1961–1990 (14°C). 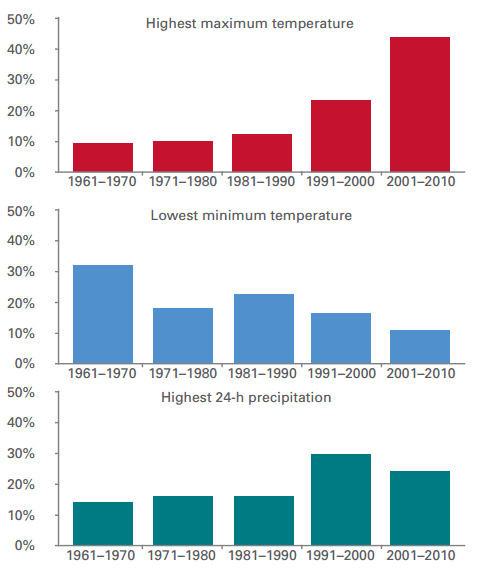 ...it is worth noting the very large increase (more than 2,000 per cent) in the loss of life from heatwaves, particularly during the unprecedented extreme heat events that affected Europe in the summer of 2003 and the Russian Federation in the summer of 2010. On the other hand, there were fewer deaths due to storms and floods in 2001–2010 compared to 1991–2000, with decreases of 16 per cent and 43 per cent, respectively, thanks, in good part, to better early warning systems and increased preparedness. There were fewer deaths, even while exposure to extreme events increased as populations grew and more people were living in disaster-prone areas. According to the 2011 Global Assessment Report, the average population exposed to flooding every year increased by 114 per cent globally between 1970 and 2010, a period in which the world’s population increased by 87 per cent from 3.7 billion to 6.9 billion. The number of people exposed to severe storms almost tripled in cyclone-prone areas, increasing by 192 per cent, in the same period. While the risk of death and injury from storms and floods declined, the vulnerability of property increased. This is because the expansion of socio-economic and infrastructural assets led to an increase in the amount and value of property exposed to weather and climate extremes. ...No clear trend has been found in tropical cyclones and extra-tropical storms at the global level. More complete datasets will be needed in order to perform robust analyses of trends in the frequency and intensity of these hazards. Distinguishing between natural climate variability and human-induced climate change will also require datasets that are more complete and long-term. A decade is the minimum possible timeframe for detecting temperature changes. Interesting to see what a fake skeptic wants his readers to take note of, isn't it. Australia rated more than one mention in the WMO report, with a fact I wasn't aware of. Not the temperature itself (I was nearby and noticed), but the particular record it broke: "During summer 2009, Victoria reached its highest temperature with 48.8˚C at Hopetown, the highest temperature ever recorded so far south anywhere in the world." I'll just add one more chart. This one is of the glacier mass balance. That one is a big concern. Not just for its impact on climate but for the impact on water supplies for millions of people. July 3, 2013 at 9:23 am I’d be curious as to their data set, aren’t most data sets showing a steady or declining temps during the same decade? July 3, 2013 at 9:38 am I think skeptics often misunderstand the language of the Alarmists. The purpose of this report is to identify a gap in the literature that needs to be closed. They are blowing the dog whistle to get the climate scientologist to focus on manufacturing papers that say that AGW causes extreme weather. The treemometer hoax didn’t work, the computer models failed, so they need a new strategy. Extreme weather is the perfect strategy for the alarmists. Everyday we have an extreme weather event somewhere in the world. A skill propagandist can convince people that these events are now somehow unusual. But they need some folks to manufacture some papers to give it the air of scientific legitimacy. July 3, 2013 at 10:41 am ...As for the 2003 heat wave more likely in a warming world, only those with an agenda or complete ignorance of the synoptic reality would keep accrediting this fantasy. July 3, 2013 at 10:56 am You self-serving hypocrite. You are in business milking tax money based on the completely bogus manmade global warming scare. Your post is simply a regurgitation of cherry-picked nonsense that does nothing to falsify the climate Null Hypothesis. Could you be any less credible? It would be interesting to run a text sentiment analyzer against the WUWT comment streams on a regular basis. They do seem to have a consistent tone of scorn, mockery and disdain, with very little positive affect at all. That's an interesting idea, Bernard, but surely the results were... unsurprising? (I won't repeat here my best guess for the dominant words in the recent Deltoid thread). "Finally, this site has won the internet’s “Best Science & Technology” Weblog Award — for the third year running — for a very good reason: it does not censor skeptics’ comments like the un-named blogs you mentioned." 2) WUWT often censors comments from people who support the professional, expert understanding of science rather than the pseudoscience that is favoured here. 3) Allowing the comments of sceptics who are very disproportionately uneducated, uninformed, and/or ideologically motivated is no recommendation. 4) In the past WUWT has censored whole threads by removing them when they have been demonstrated to be egregiously scientifically and/or analytically incorrect, and by failing to post promised followings-up of previous threads where the content has been demonstrated to be egregiously scientifically and/or analytically incorrect. We're all still waiting in breathless anticipation for Anthony to post his follow up to his article on how UHI has raised the surface temperatures in China's remote hinterland. Talking of no follow up on erroneous posts, we will soon have the first anniversary of the famous Watts et al (2012) post. Bernard, I think any post containing the word "Anthony" is held in moderation for Anthony. What do you know? That comment that I just screen-captured was moderated away - presto! It only took a few minutes! Looks as if it's back again, Bernard J. After I fell foul of Anthony first time around (because I corrected something he wrote about Victoria, Australia), my posts stopped showing up as being in moderation. They disappeared as soon as I clicked "post comment". I think were sent to a special queue for Anthony to decide about. That way he could snark about "anonymous cowards" etc and make sure his guard dogs barked at me. Yep, it's back. I'm not sure if it was just sidelined for Watts, as you suggest, or retrieved because they cottoned on to me webciting every comment, but Smokey/DBS is pouting rather a lot. dbstealey aka Smokey the guard dog lives in an unreality of his own fantasy world, where black is white and up is down and anything goes if Smokey says so. Also, your webcite link does not prove what you were alleging, which was specifically “censorship”. Anthony has closed out articles and threads before, and they have nothing to do with your belief system, or with “censorship”. Smokey has to be Anthony's staunchest supporter, unquestioningly doing his bidding - even though he doesn't agree with Anthony when he says the greenhouse effect is real. Of the regulars, Smokey probably has the biggest brain dysfunction and the least self-awareness. And that's saying something given the sort of audience WUWT caters to. Smokey is a near perfect example of illogicality and a compartmentalised brain. He can hold umpteen conflicting factoids in his head and spout them at the same time, apparently oblivious to any conflict. Smokey/dbstealey is a mendacious propagandist.